Last weekend, Dove Cottage's bedroom and spare room, the rather grandly named Blue Room, looked very much like the store rooms of a clothes shop. It all started on Saturday, when I made a start on packing for our holiday. Since our destination will once again be the UK, a suitcase full of flimsy Summer frocks might be a bit too optimistic, although I will obviously be taking some of those. But, as regardless of the weather we will be out and about a lot, I will also be taking several pairs of trousers. 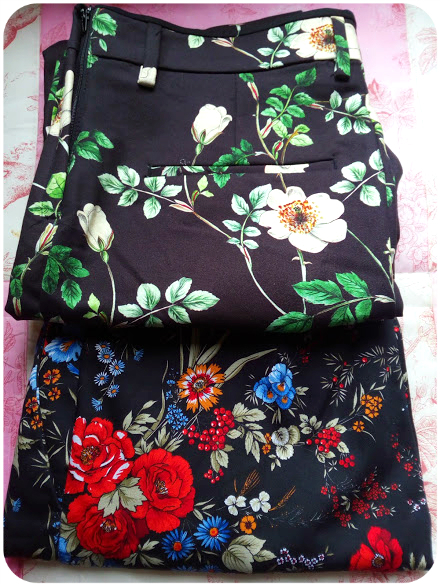 After investing in some nice pairs of red and green trousers last year, I now went a step further by acquiring two pairs sporting very Polyester Princess-worthy flower prints, so that in the not unlikely event that the weather gods are once again up to no good, I will at least be able to look the part. I tried out a mountain of blouses and short-sleeved jumpers to wear with them and managed to whittle them down to a manageable shortlist. Even so, travelling light will not be on the cards, but why should I, since we are travelling by car? Have no fear, I won't be taking that much! 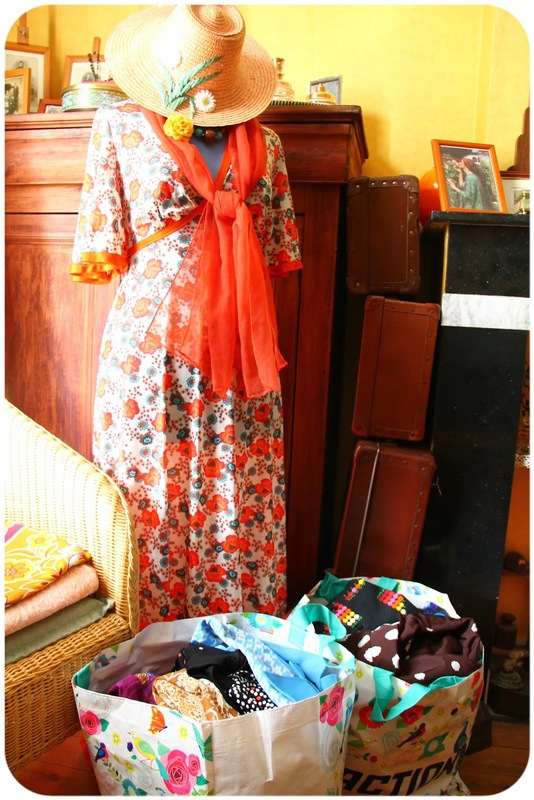 No, these bags contain part of my vintage stock, which I'm keeping for selling at our local flea market in July. There's a total of five boxes and four large bags, so the day won't be very far off when we, like Vix, will need to have a shed built in our garden! Don't you love Angelica's stylish Summer outfit, by the way? There's a reason why my vintage stock had to come out of our bedroom's built-in closet: I had invited a friend for a private shopping session on Sunday. I'm glad to report that she went home with no less than six dresses and a blouse! Now look what happened: the dress I'm wearing here was unearthed from one of the bags. Why on earth I was thinking of selling it, I do not know, but I presume it was its beige-ness that put me off. But isn't that print gorgeous? I wore it on Saturday, playing an on/off game with an ancient lilac short-sleeved cardigan from New Look. I do wish I'd picked it up in more colourways back then! 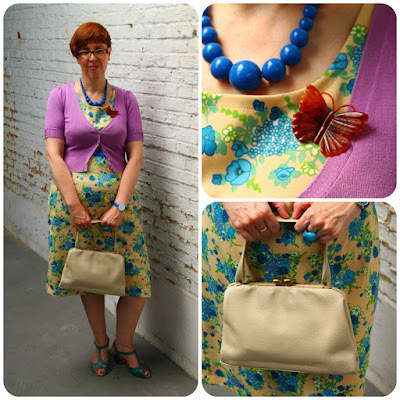 I chose sky blue for my belt and necklace and added a translucent brown, vintage butterfly brooch. My sandals are my turquoise Miz Mooz misfits: I bought them several years ago at a ridiculously reduced price at the tail end of the sales, as the colour of one of them was rather faded. The difference in colour was soon rectified by putting the other one out in the sun for a while, so that it is now hardly noticeable. The mountains of clothes were doing my head in by then, so we left the house to go and water the plants at Jos's son and daughter in law, who are currently travelling in Canada. 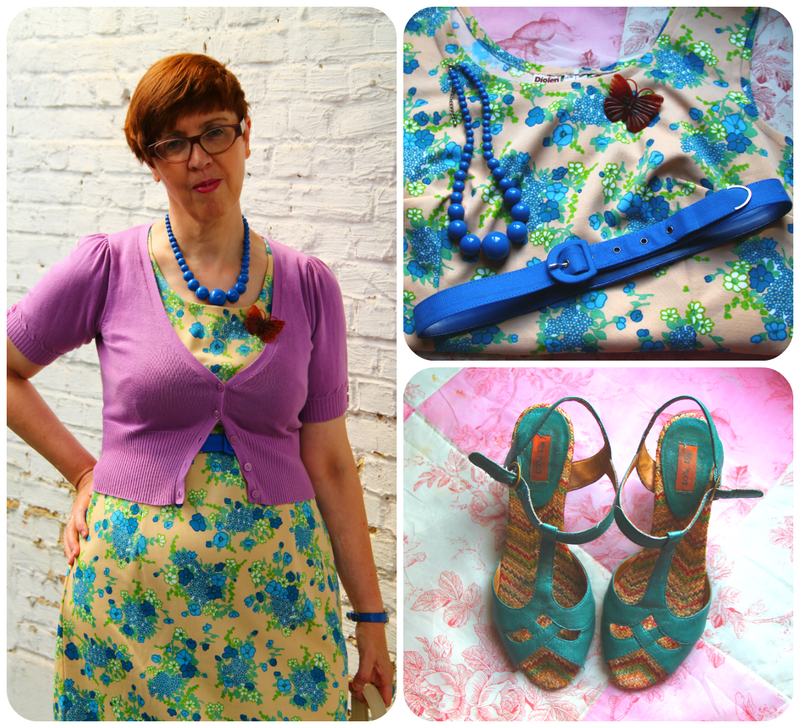 We stopped briefly at our most local charity shop, and wouldn't you know it: I found more stuff. 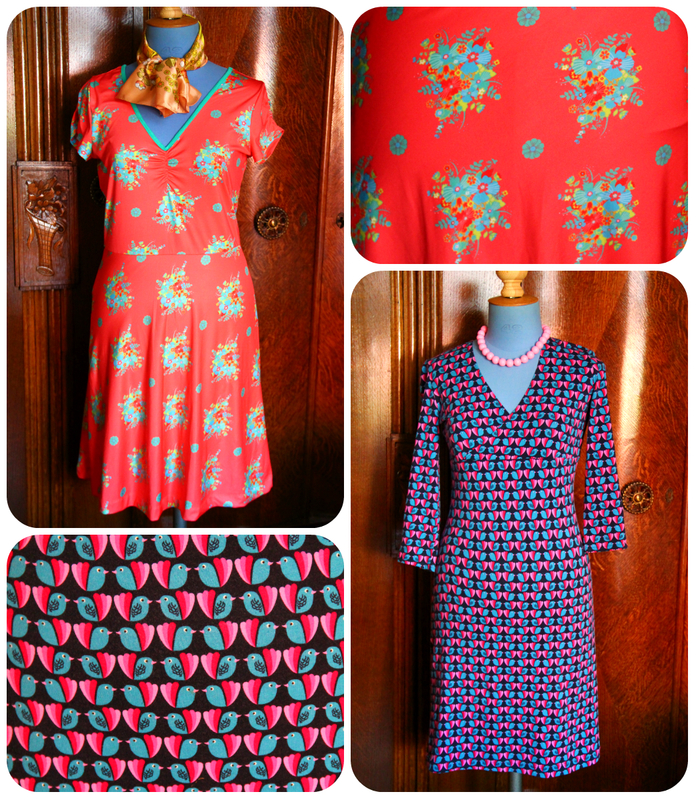 These two new-to-me stretchy frocks came home with me. 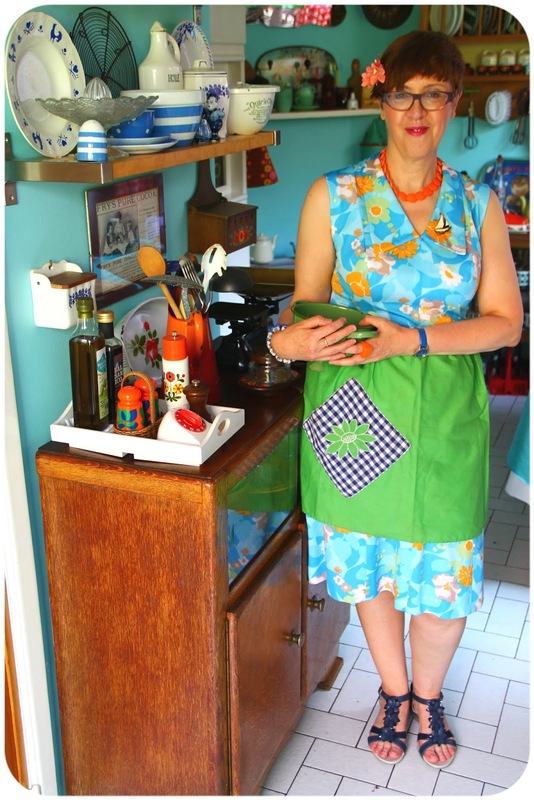 As I was once more making use of Angelica's services as a model, I took the opportunity to dress her in this funky vintage frock, in a lined cotton fabric, which I found at Think Twice the other day. 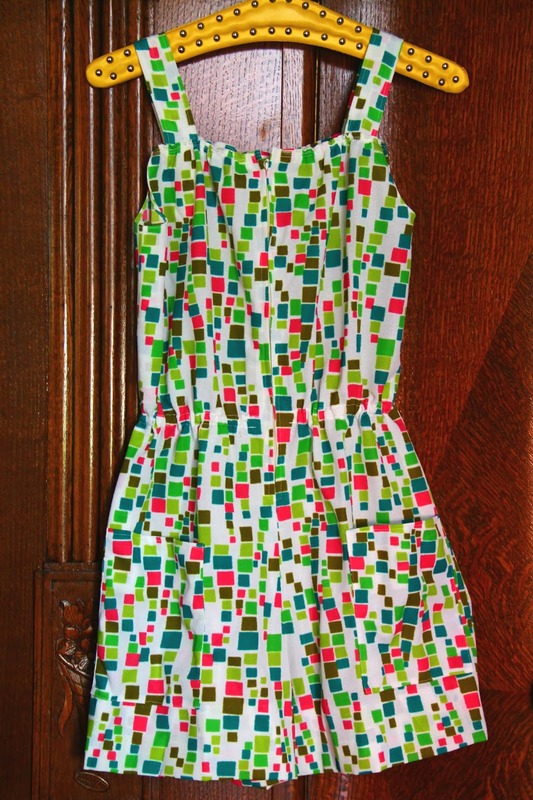 I came across this playful play-suit on the same day. I've always had a penchant for play-suits - 1960s Barbie has quite a few of them in her wardrobe - but I haven't had one myself since the late 1990s. At under € 5, it was futile to resist this one, which will be perfect to wear around the house on hot, sticky days. Meanwhile, the Sempervivum, or houseleek, on our kitchen windowsill is flowering for the very first time, and at the back of the garden the frothy lime green flowers of Lady's Mantle have joined the plant's soft, downy leaves. 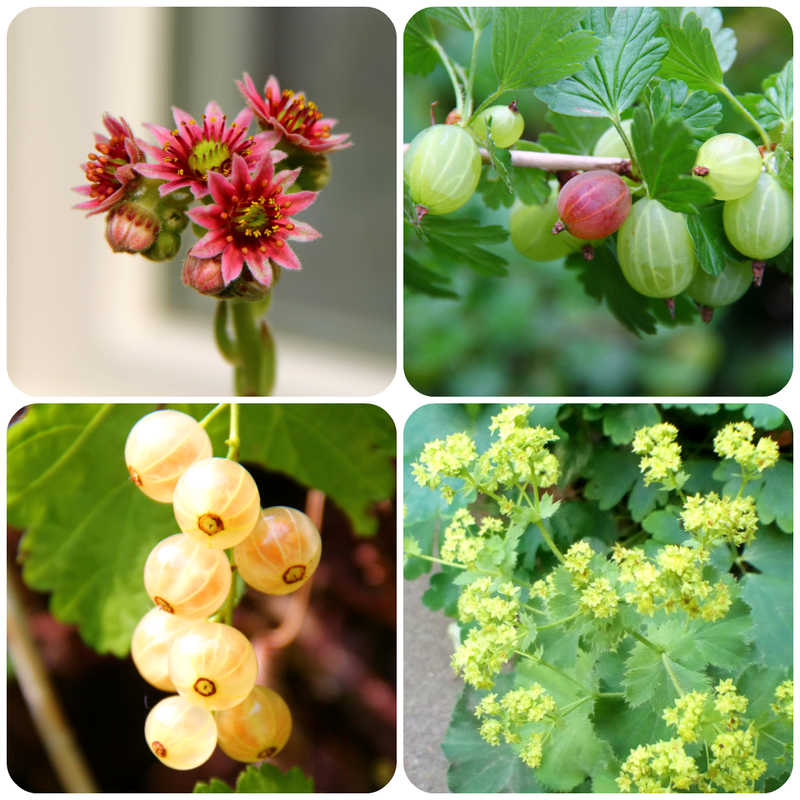 A glut of gooseberries awaits us, but how strange that only one of them has turned red already. Jos reckons there is something wrong with it. 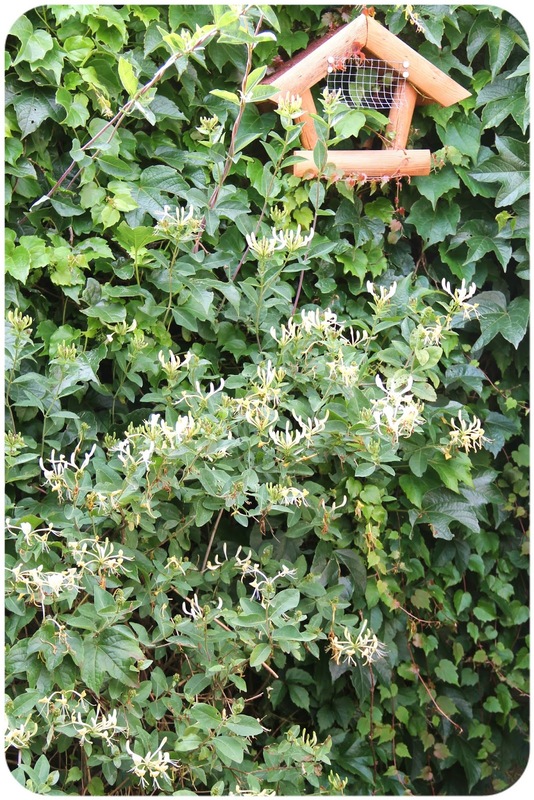 Nothing wrong with our white currents, apart from the fact that most of them have ended up being eaten by a cunning pair of local wood pigeons! 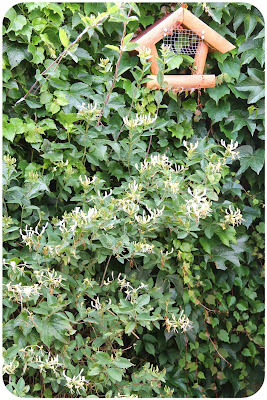 Jos has cut back some of our garden's jungly growth, so that we can see all the way to the back wall, where a sweetly scented honeysuckle is growing among the profusion of greenery provided by a rampant Virginia creeper. Here is what I was wearing on Sunday. I love this sturdy cotton skirt, with its ruffly hem trimmed by orange rick rack. This, and the orange flowers, prompted my choice of top, a cap sleeved blouse sprinkled with black and white dots. My footwear were as a pair of ancient orange ballerinas. 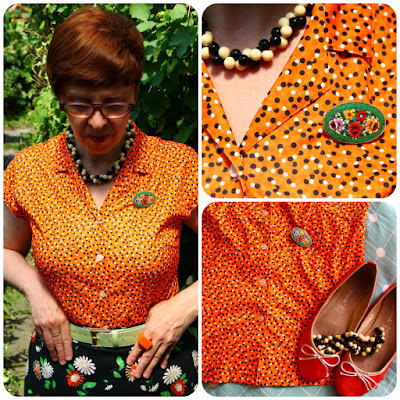 The vintage necklace consisting of intertwined black and white plastic beads were the obvious accompaniment, while I brought out the green of the leaves on my skirt by pinning a green-based micromosaic brooch to my blouse. I wore the skirt again on Monday, but with a different top: a green, lacy, short-sleeved knit jumper. I'd overlooked this one when I was packing, but I think it would be perfect with the first pair of floral trousers, so it went straight into the wash, after which it has joined the others tops in my suitcase. And so, we have come at the end of my post. I'm officially on vacation now and, after we have finished packing tomorrow, we will be up bright and early on Saturday, when we're off to the UK. So, no posting from me for a while, as I will be mostly off-line for two weeks, although I will be reading your blogs when time and WiFi allows. See you in July with lots of adventures to share! More often than not, I am not the most patient of people. Being forever strapped for time, I haven't got the patience to queue in shops, wait for unreliable public transport, be stuck in traffic or put up with cold callers, who, I'm sure, have all put me on their to-be-avoided list by now! However, I'm the complete opposite when it comes to shopping. 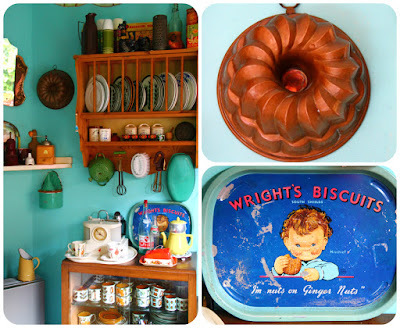 If we need something for Dove Cottage, for instance, I'm always prepared to look around the charity shops first, rather than rushing off to the high street, or worse, joining the crowds at the Swedish warehouse of sameness. 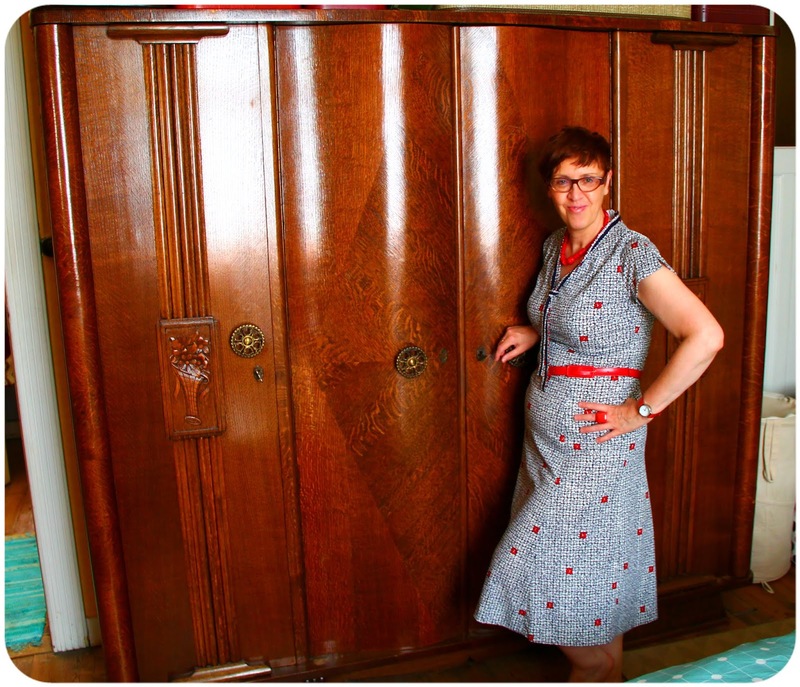 Take my beloved vintage wardrobe. We trawled around charity and consignment shops for many months until finally, in March 2015, I met the wardrobe of my dreams! And then there is clothes shopping! As an almost exclusive second hand shopper, I usually go shopping without any particular expectations, and it is the element of surprise, the stumbling upon that one, unique, serendipitous find which makes my heart beat faster. But once in a while, there is something which is on the wish list residing at the back of my mind, for which, as with the wardrobe, I am biding my time. 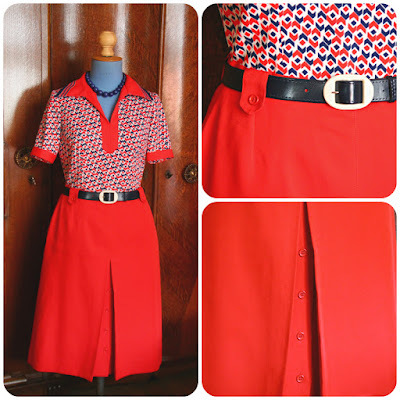 I'd been looking for a particular style of red skirt for well over a year but, even though red skirts aren't exactly a rare commodity, I hadn't come across the one, in the right shape, size and material. Until two Saturdays ago, that is. 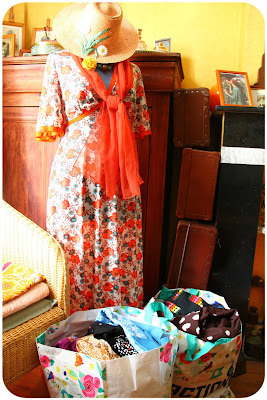 It was on the same day that I found the cape-sleeved vintage maxi, so it must have been my lucky day! The skirt is an A-line midi length and has a pleat at the front, half hiding a row of buttons. It strongly reminds me of a skirt I had back when I was about 15. 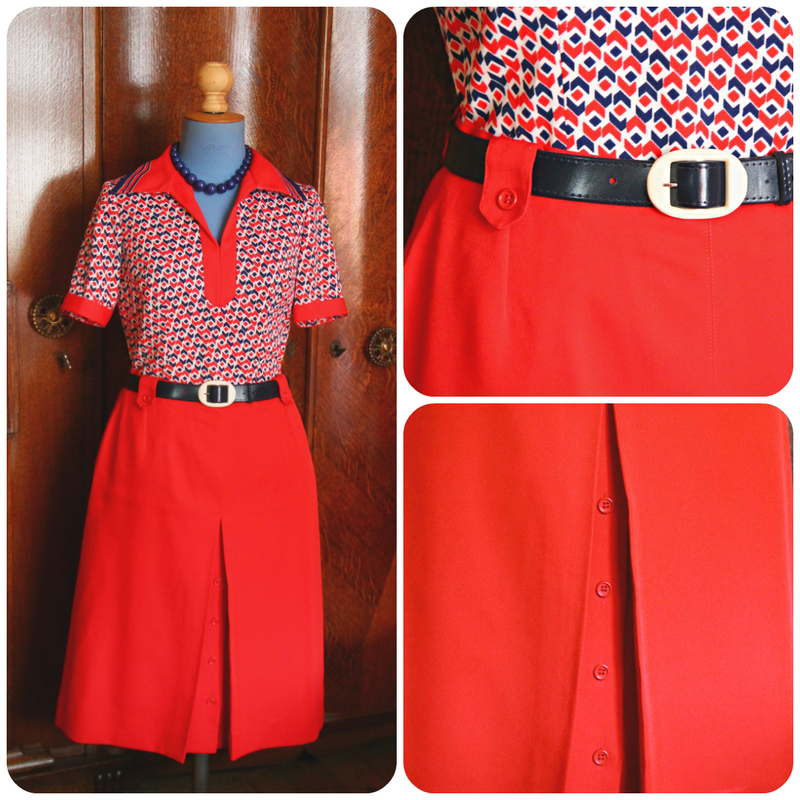 The top I wore with it was the same style as the one I paired the red skirt with here, but in plain white, with a red placket and collar, and showing just a little bit more cleavage. I remember getting wolf-whistled at when I rode my bike to school, something which had never happened before and, feeling embarrassed, it was a long time until I wore that top again with any confidence. Another item on the wish list was a jumpsuit. The chances of finding a vintage one had always been very slim and new-to-me ones weren't turning up at the charity shops either. 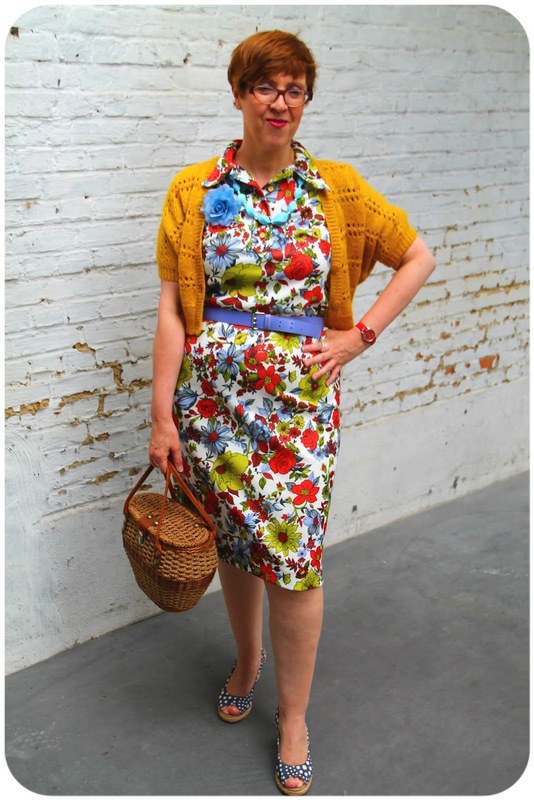 As they have been back in fashion for a while, I'd even ventured onto the high street but I hadn't been able to find anything I liked. Even when it comes to fast fashion, I am very particular and not willing to compromise until I find exactly what I want. One particularly hot day, I was returning from a work-related errand, when I walked past a recently opened shop here in Antwerp, one I always vowed I wouldn't be seen dead in. Consequently, ever since it opened, I'd been avoiding it like the plague but, as it was still early morning and it looked relatively empty, I walked in, relishing the coolness provided by the air conditioning. And there it was! 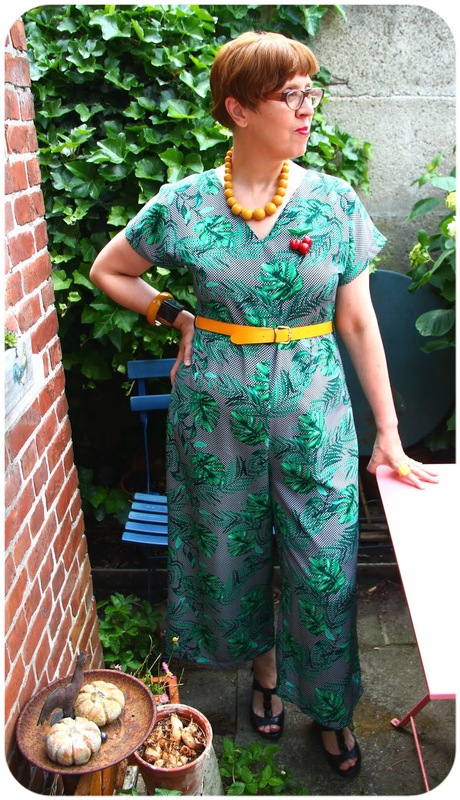 It wasn't skimpy as most jumpsuits I'd seen in the shops, it had sleeves and a print I instantaneously liked. Still not expecting too much, I made my way to the changing rooms, but I needn't have worried as it fit like a dream! 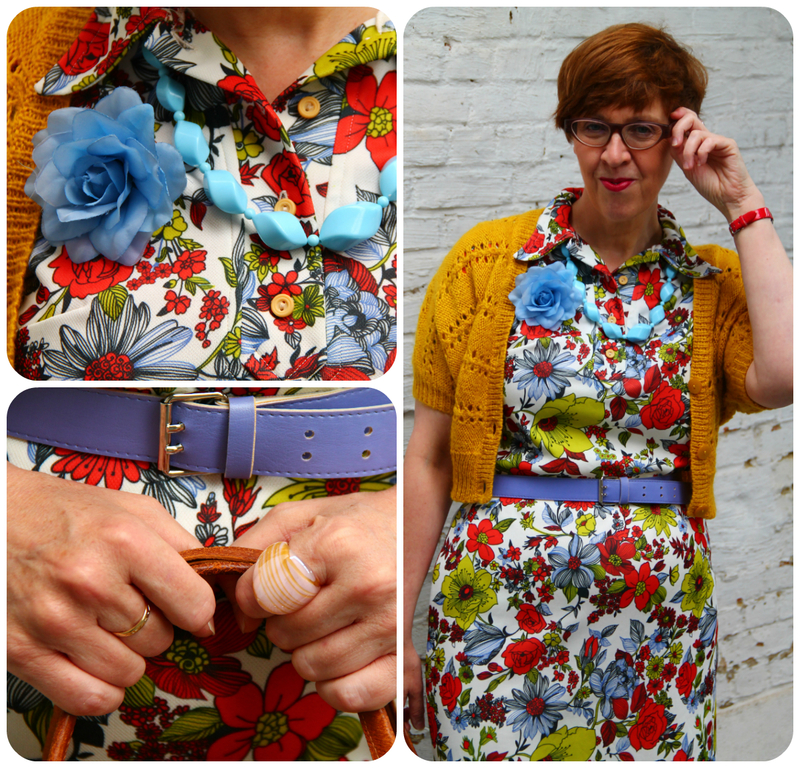 Although it came with a tie belt, I chose to wear it with a yellow vinyl one, piling on some coordinating jewellery. 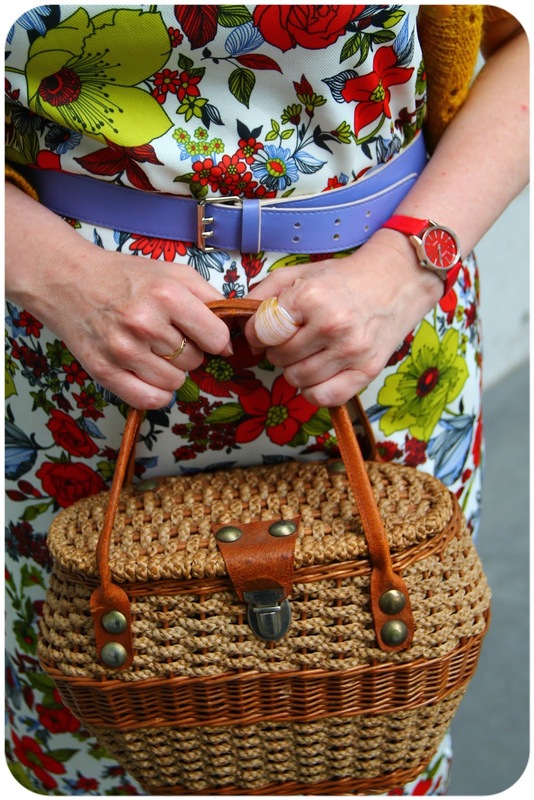 You might have spotted the groovy bracelet I'm wearing. That was picked up during a short charity shopping trip last weekend. There was an accompanying pair of earrings (which I won't be wearing as my ears aren't pierced) and a necklace too, and the whole lot went for the crazy price of € 1,50. 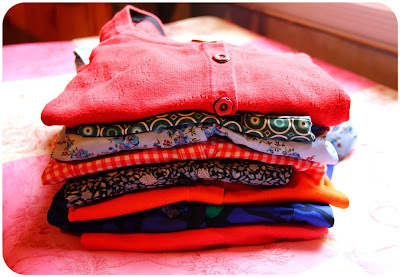 I also found some lightweight short-sleeved summer tops and two cardigans. 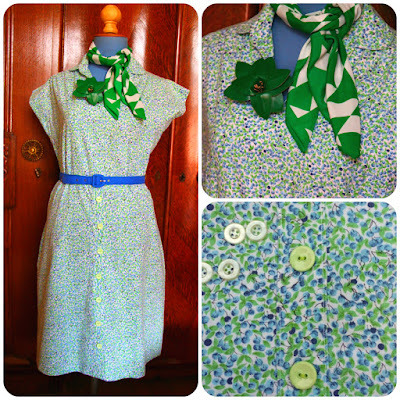 The print of this vintage C&A frock might be a bit more demure than what I'm usually going for, but its cotton fabric and fresh green and blue print will be perfect for hot Summer days. 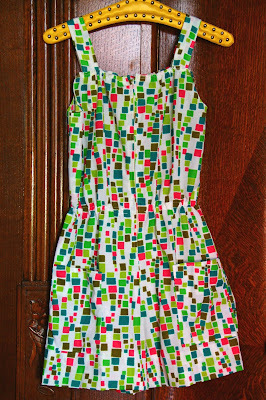 Its skirt had a row of boring buttons down the front, which I replaced with more fitting, pale green ones from my stash. 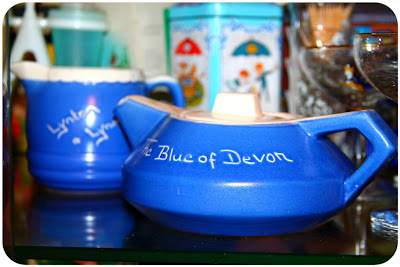 The day's final find was a Devon Blue Ware teapot which was sitting rather forlornly and feeling sorry for itself amid some other blue and white pottery on a shelf. Apparently, it had been there for quite a while, as we could only just make out its price, € 0,50, on its faded label. 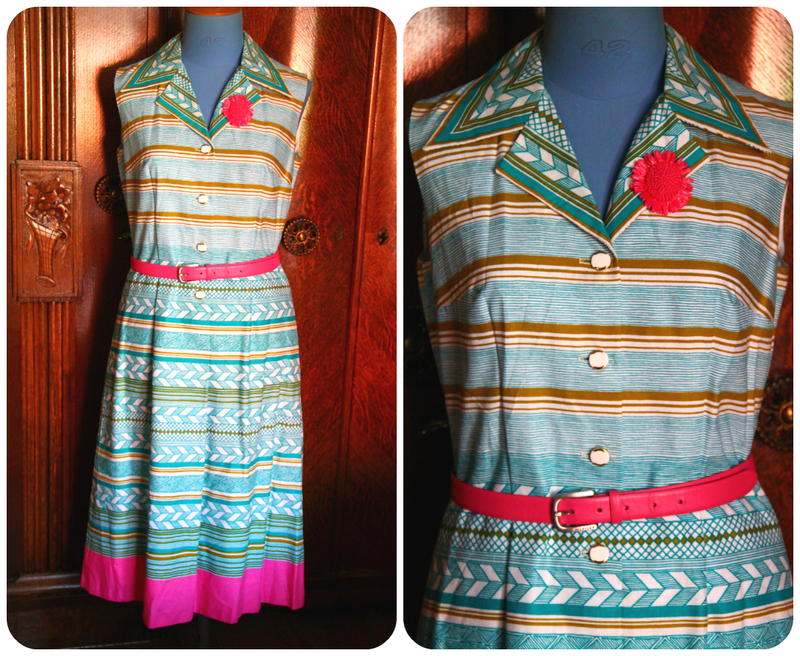 And now, let's look at last Saturday's outfit. 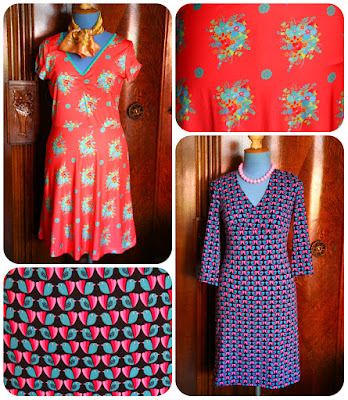 My Diolen dress has a full-on print of bright Summer flowers, in red, acid green and light blue. I admit that it got somewhat neglected, as I don't think I wore it at all last Summer. Feeling a bit off that morning, its fiery print was just what I needed to cheer myself up. My accessories, a lavender blue belt, sky blue flower corsage and light blue necklace helped chase my mild case of the blues away. In order to balance out all the blues, I wore my mustard yellow short-sleeved cardigan on top. You might recognize my wicker bag, which I picked up at the huge flea market back in May. Sadly, one of its handles broke off while we were out shopping, and it's now awaiting repair. 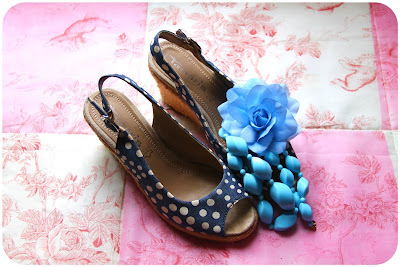 I can't finish this post without showing you the wonderful canvas peep toe wedges I was wearing. They are Tamaris and a lucky sales bargain from a couple of years ago. A pair that should definitely come out a bit more! I'm taking my jumpsuit to Patti's Visible Monday at Not Dead Yet Style! 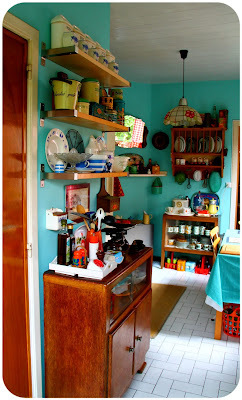 Throughout my two years and a bit of blogging, I have regularly shown you some of the kitchenalia we are collecting. 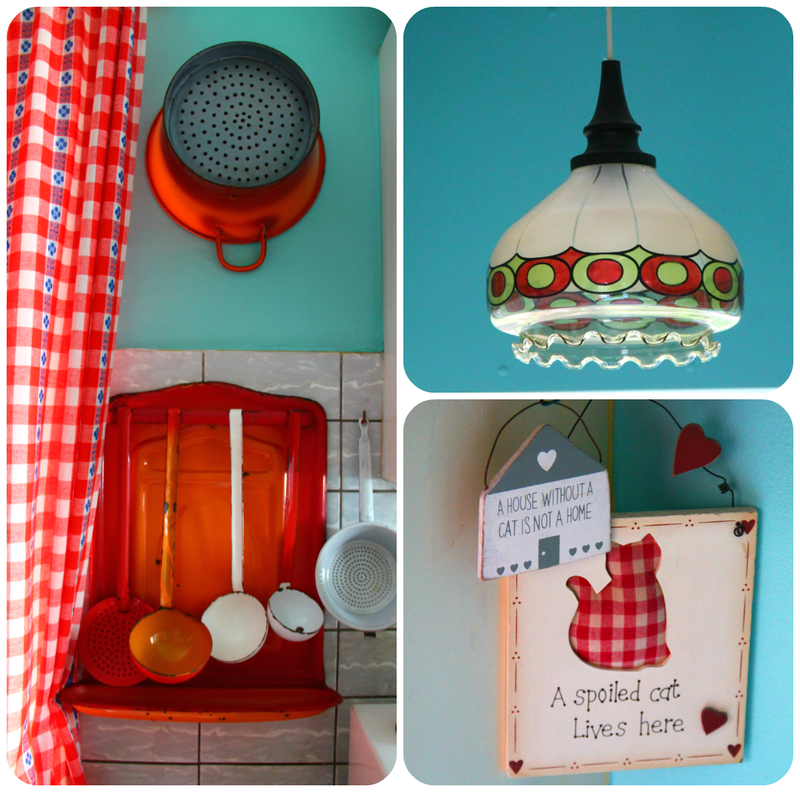 Some of you have asked to show a bit more of my kitchen, so by popular request, here's a little peek into what must be Dove Cottage's most colourful room. 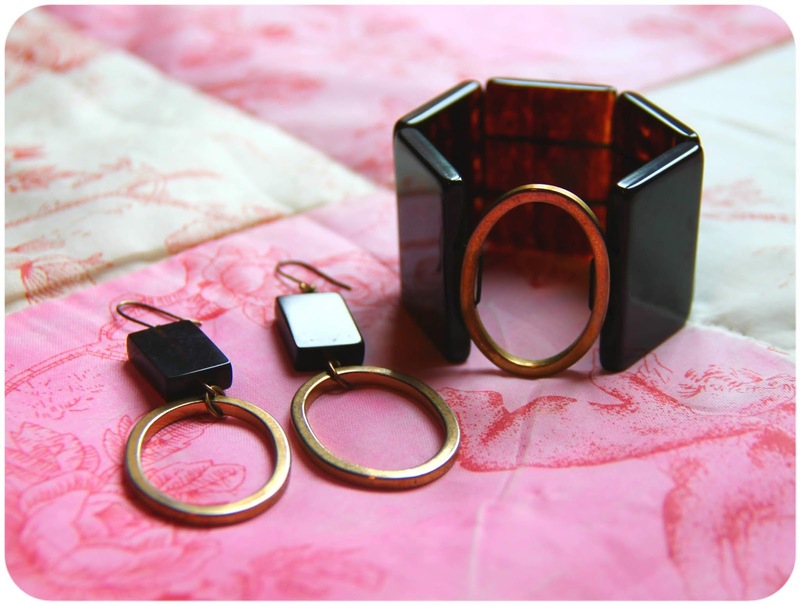 This post will only give you a general idea as it is barely scratching the surface of our collection, which was begun even before we moved to Dove Cottage! 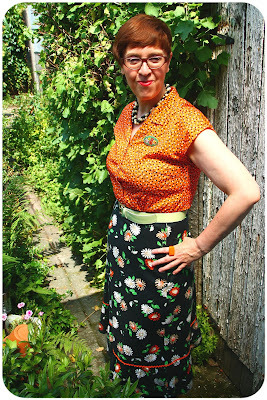 You'll probably recognize the frock I'm wearing from my previous post, as we took most of these photos on the same day. 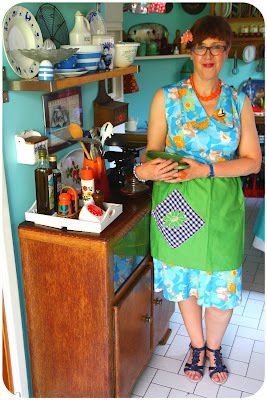 For good measure, I have added one of my vintage aprons. 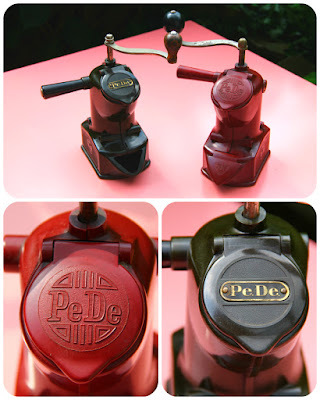 These can generally be picked up at charity shops and flea market for next to nothing, often proudly displaying their wear and tear, as well as the odd faded cooking stain. 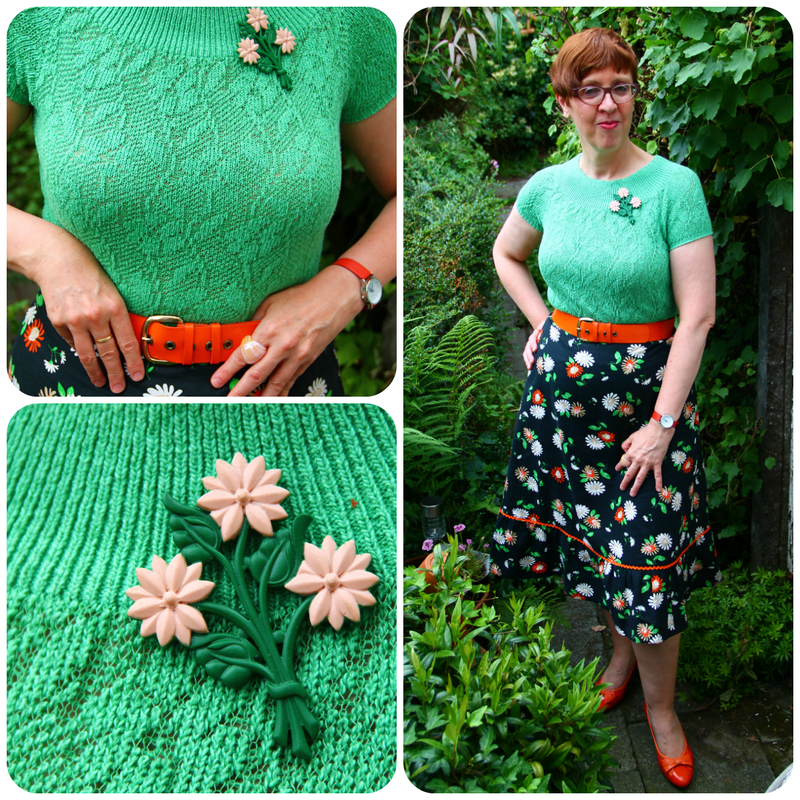 The one I'm wearing is one of my favourites (well, you know, it's green!) and in perfect condition. I'm sure it will come as no surprise that Dove Cottage doesn't have a classic, fitted kitchen. 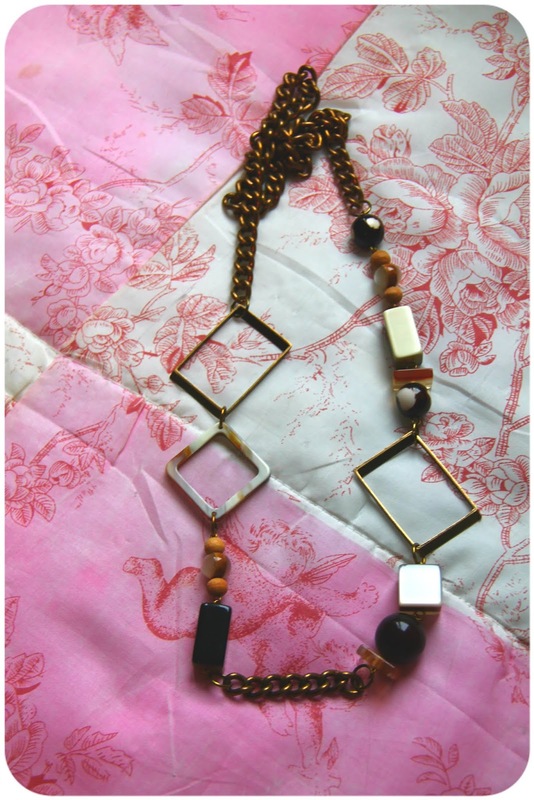 It is, in fact, a mix and match affair, which we have added to over the years. Pride of place is taken by this vintage kitchen cupboard, which was already in situ, and one of the original features which sold Dove Cottage to us. 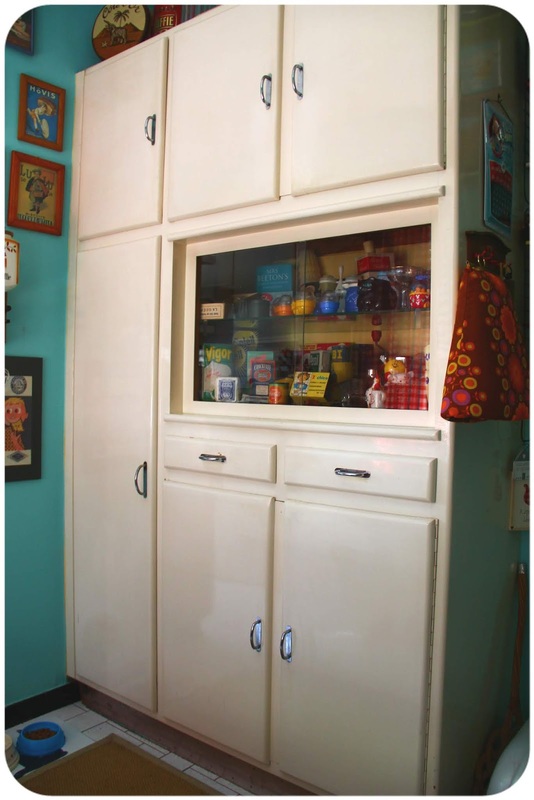 Not only does it have oodles of storage space, it has the added bonus of a glass fronted display cabinet. This is, of course, the perfect place for showcasing our ever growing collection of smaller kitchenalia as well as some other odds and ends. 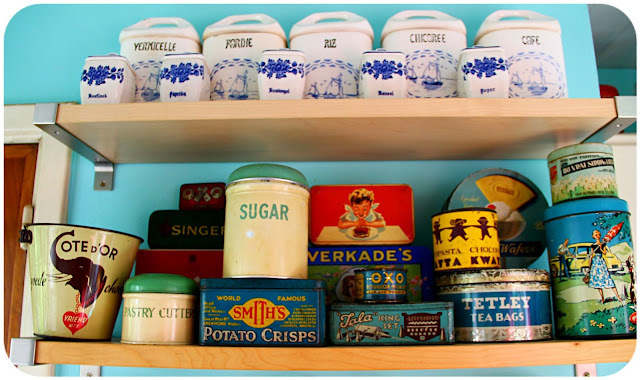 There's a whole section dedicated to soaps and washing powders, while the rest is a jumble of baking paraphernalia, small gadgets and other curiosities, mugs and glasses, vintage Tupperware, and a small selection of family heirlooms. It is becoming ever more of a challenge to fit it all in, yet still we keep adding things. In fact, we have added another treasure since these photos were taken. Standing in the doorway between our dining room and kitchen, this is the view towards the back door and garden. 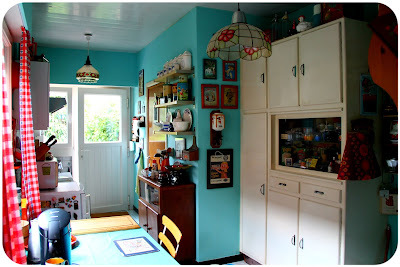 On the left, just visible behind the kitchen table, which doubles as a work space, are our fridge and cooker, with a small run of traditional kitchen cabinets, and a sink unit beyond. The units were already there when we bought Dove Cottage, and although they are a little tired looking, not to mention a bit boring, we have yet to replace them, which I guess we will do at some point, together with the very impractical white glazed floor tiles. 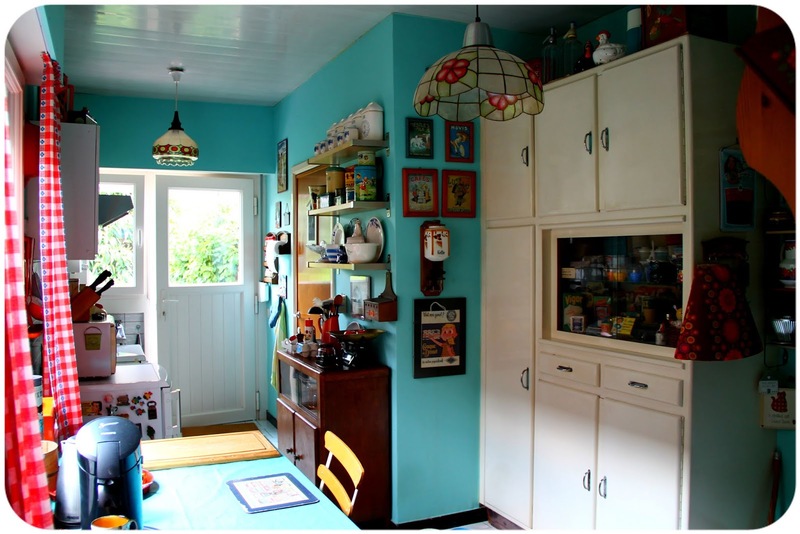 On the right is a charity shopped vintage cabinet, again featuring glass sliding doors, above which three long shelves have been put up for displaying even more of our vintage kitchenalia. This is the view in the other direction, taken from the back door. 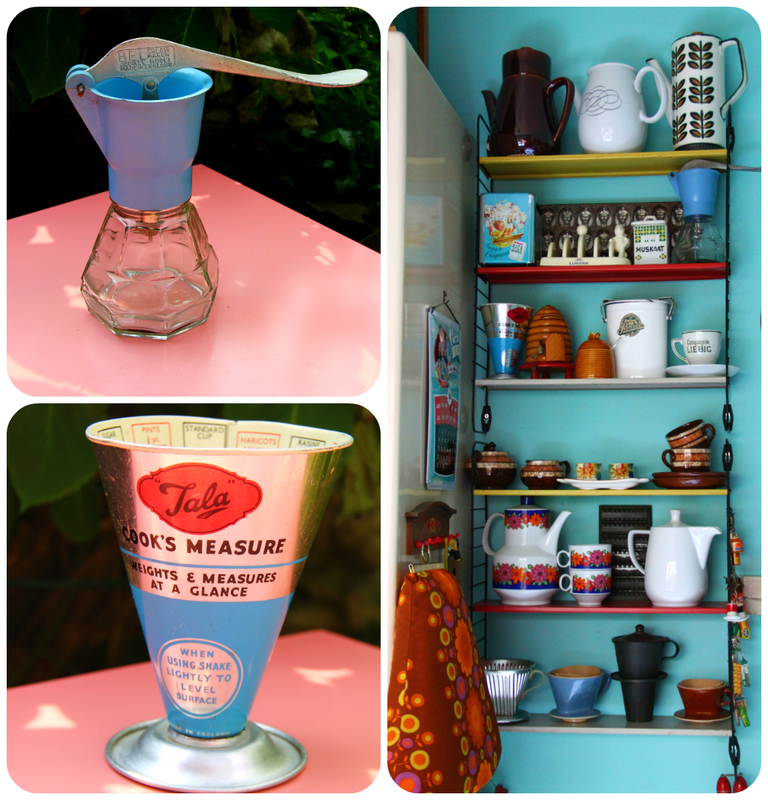 The top of the cabinet has some kitchen essentials: scales, an enamel jug full of utensils and a tray containing condiments as well as our kitchen timer. The traditional kitchen scales aren't vintage but rather bought new in a kitchen shop in Lyme Regis back in 1997, before we moved to Dove Cottage. Earlier during that same holiday, we'd seen lovely vintage kitchen scales in an antique shop in Exeter, but didn't buy it as according to Jos we had nowhere to put it. As it goes, we regretted it almost instantly, so we settled for this new one instead. At the far end is yet another charity shopped cabinet - again featuring glass sliding doors - which holds most of our Boch crockery. On top is our treasured Teasmade, a French coffee pot, a Wedgwood butter dish found in an antiques centre in Wales and a battered Wright's Biscuits tray, a lucky find at a local flea market many years ago. I don't remember where the copper jelly mould came from. 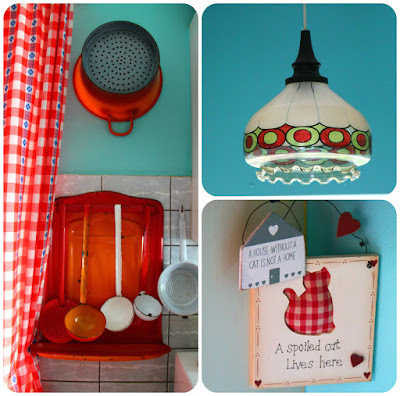 The hanging plate rack was one of the first items we added to Dove Cottage's kitchen. 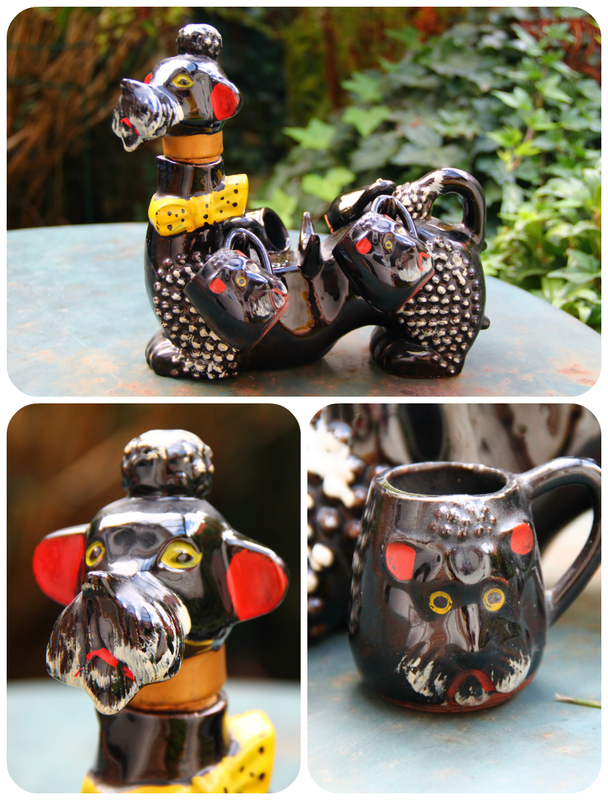 It has a shallow shelf below the rack itself, as well as some handy hooks, but we still ran out of space, so that there are now Thermos flasks, a ceramic poodle decanter with four tiny cups (see here), as well as some other bits and bobs, living on top of it. We've made use of the mantlepiece on the left too, which contains our collection of coffee grinders. These two Bakelite ones, in green as well as the usual reddish brown, are the rarest. 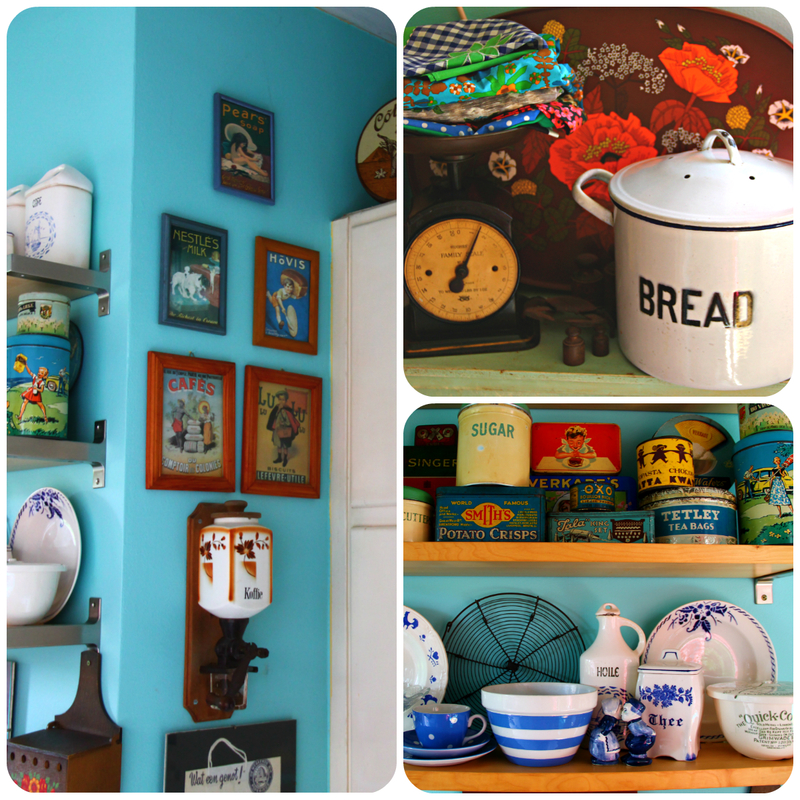 Crammed between the mantlepiece and the cupboard are yet more shelves! These are shallow Tomado shelves, a rarity in itself, picked up at Blender Vintage Shop when they were still trading. They contain coffee pots and filters as well as some odd pieces of crockery. The vintage creamer (top left) and Tala Cook's Measure both came from Cardigan Antique Centre. 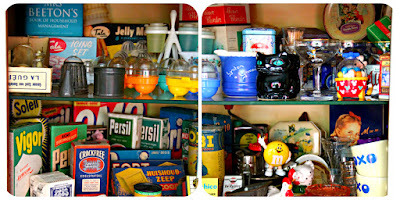 Returning to the shelves above the cabinet, let's have a look at the stuff which is crammed on them. The top shelf has a set of vintage ceramic canisters. The larger ones were a consignment shop find which we brought home about twenty years ago. They have a sailing boat design and proclaim their contents in French. The smaller set, with their contents written in Flemish, were a recent gift from my friend Inez, and they match a salt cellar and tea canister we already owned. The middle shelf holds vintage tins in all shapes and sizes. 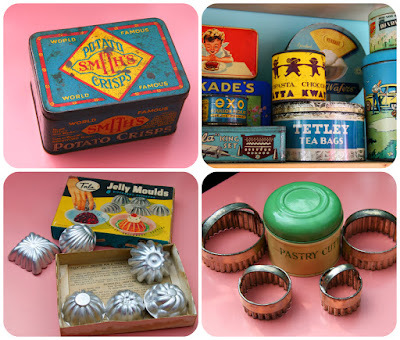 The jelly moulds and pastry cutters, both from Tala, were found in a delightful antique centre in Newcastle Emlyn, Wales. 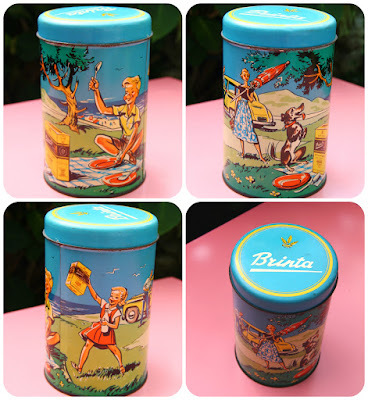 Another favourite is this colourful and fabulously illustrated tin, probably dating from the late 1950s, which used to contain Brinta, a Dutch brand of porridge. 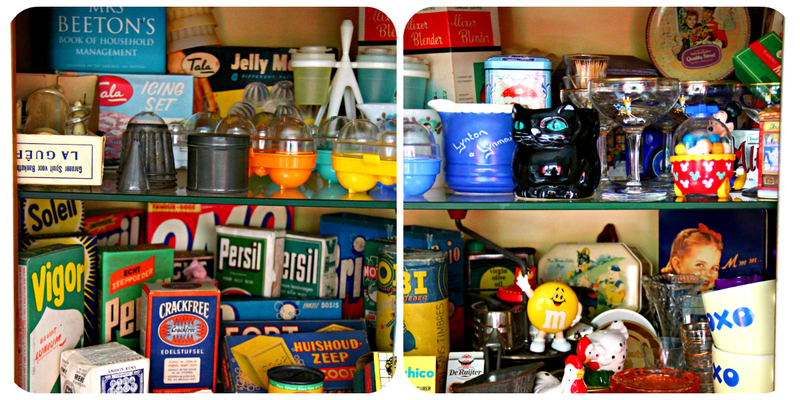 The bottom shelf, like the top one, has a blue and white theme. You can see part of the shelf in the bottom right photo of the next collage. Centre stage is taken by our small collection of T.G. Green items, a Cornishware bowl and salt shaker and an orphan crockery set in Blue Domino. 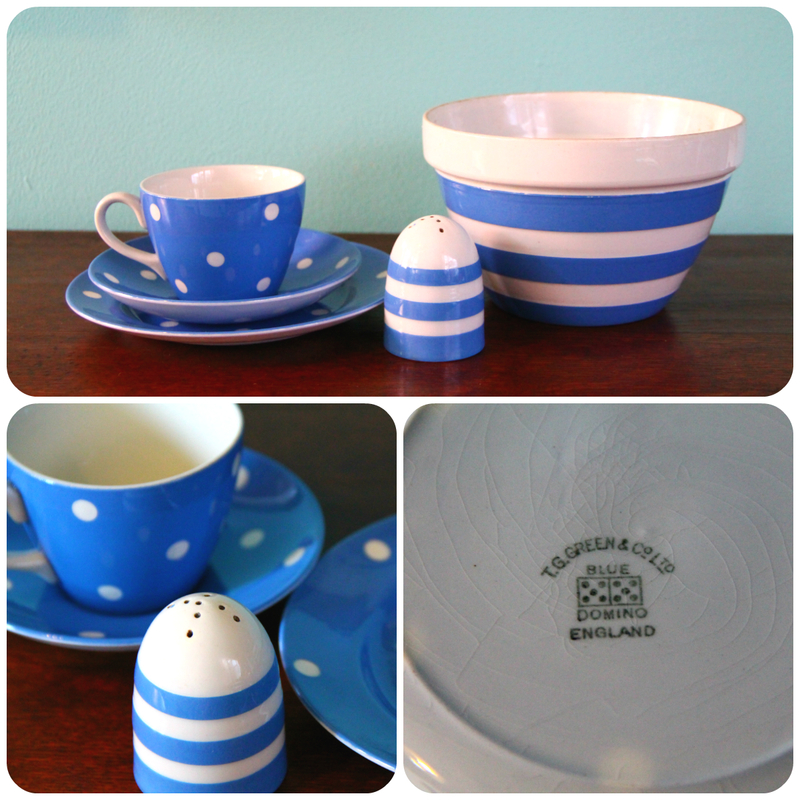 This set was bought in the village of Lower Solva, Pembrokeshire, back in 2011. The bread bin came from a shop specializing in kitchenalia in Rye, East Sussex. The "family scale", its twin recently spotted in the 1910's episode of Back in Time for Dinner, holds my collection of vintage aprons. The French fries potato cutter (again, it should be Belgian fries, as it weren't the French who invented them) came from a small shop in Wells, Somerset, on a visit in the early noughties. 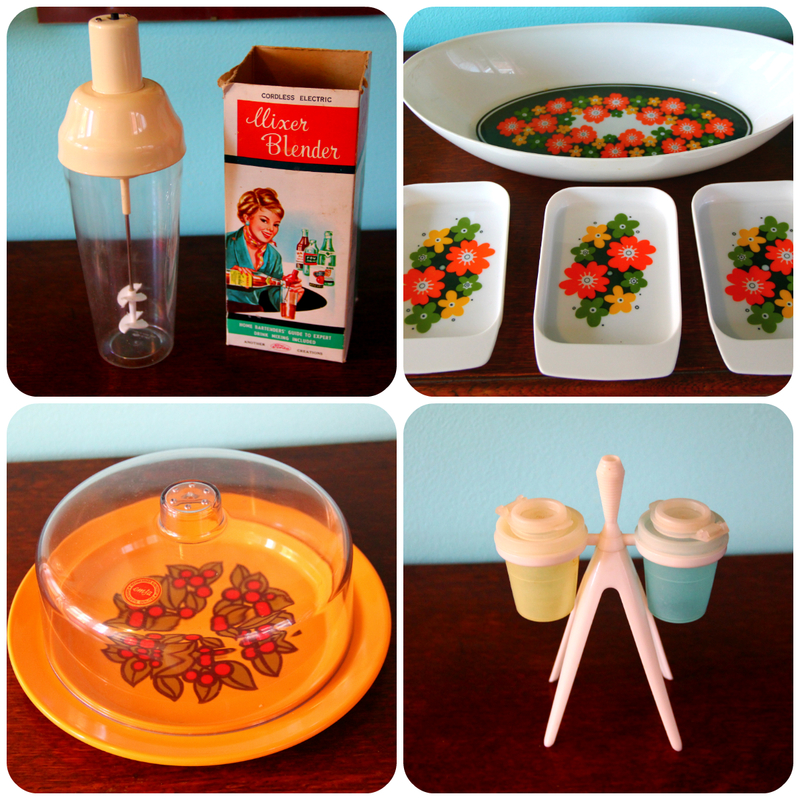 1960s and 1970s kitsch, clockwise from top left: a small boxed hand blender, Emsa serving bowl and dishes, atomic Tupperware salt and pepper set and Emsa cheese dish. 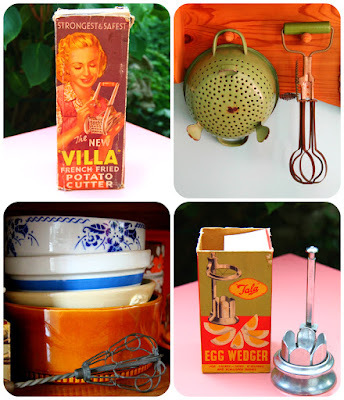 The orange enamel colander and utensil holder both came from the Expo 58 shop, while the glass light fixture was picked up in the aftermath of a charity shop retro event, when it was reduced to half price. Even the gingham curtains were charity shopped. If I remember correctly, we paid € 5 for the pair! Finally, these wooden signs, although not old, nor kitchenalia, are testimony to a very important member of the Dove Cottage household: Phoebe! That's all I have time for now, but I promise to show you more of our kitchen treasures in another post!